If ever there were a real life character destined for the Stephen Spielberg treatment it’s surely local boy François Arago. Having excelled at mathematics at college, Arago went on to develop a passion for astronomy and whilst on a project to measure the Earth’s curvature in the Balearic Islands, he was arrested on charges of spying and thrown into the dungeon of a Majorcan fortress. But he managed to escape (“disguised as a Spaniard” whatever that might have entailed!) and hiding as a stowaway he endeavoured to make his way by fishing boat back to France. Unfortunately the boat was headed the opposite way towards the North African coast where he eventually landed having nearly died of dehydration and sea sickness along the way. He duly recovered and with the help of a corrupt French consul in Algiers, Arago obtained an Austrian passport (quite why this particular faux nationality was chosen is not explained) and armed with this new ID he booked a passage on a Greek vessel bound for the port of Marseilles. Yes, this time definitely French France, no question. But a Greek tragedy lurked just around the corner for within a day of setting sail the boat was captured by pirates (masquerading as the Spanish navy) for its cargo of spices and wine. Normally in such circumstances the crew and passengers are summarily dispatched over the side but the ever-resourceful Arago managed to persuade the pirates that he was a wealthy Austrian aristocrat worth a tidy ransom. And so they took him to the Spanish mainland where he was handed over to the military commander at the fort at Rosas in return for a substantial payment – one that Arago assured the commander he would “recover fivefold” from the Austrian Embassy in Madrid. This of course never materialised and Arago found himself dumped unceremoniously back in the clink. But he once again managed to escape (in a coffin, don’t ask, it’s too long) and then stowed away on another boat bound for, oh yes, Marseilles again, skippered by the splendidly-monikered Norwegian Captain Krog. So things are at last going his way. Well they would have been if a terrible storm lasting days hadn’t blown the ship back to North Africa. Wrecked on the beach, poor old Captain Krog drowned but Arago survived – only to be captured by passing Moroccan Berber warriors. Incredibly once more he escaped, this time on one of the Berber’s camels, who turned out to be blind! And it goes on. The camel (who had been stolen by the Berbers from Algerian soldiers earlier that same day) though unable to see, made its way back instinctively and at full gallop to the army camp from whence it originated with Arago grimly hanging on for dear life. The camp commander was all for jailing the gibbering Frenchman traumatised by his high speed safari, but courtesy of a bribe (provided by the consul in Algiers who had helped him earlier) Arago is finally repatriated to La Belle France without further incident. Phew! A hero’s welcome in Perpignan greeted him and very soon after Arago landed a plum job at the prestigious national observatory in Paris. But he never rested on his laurels, going on to make important discoveries in the fields of light refraction, magnetic forces and planetary orbits. And true to form during these endeavours he was regularly found in far-flung places getting himself arrested, incarcerated or otherwise in the merde though usually managing to charm, blag, or bribe his way out. And when eventually age called a halt to his peripatetic antics, Arago went on to have a long and distinguished career in French politics, serving as a Minister for War and several other senior cabinet positions as well as for a short time Head of State during an interim government. 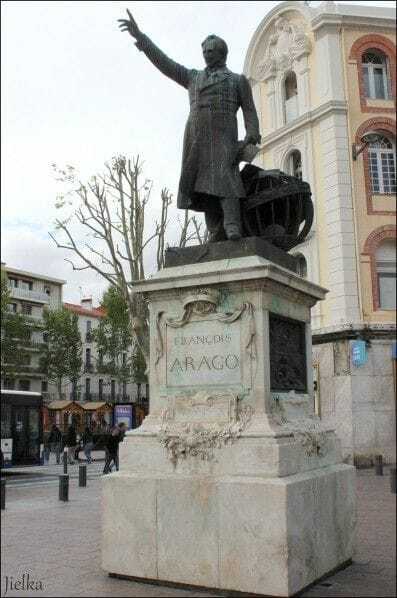 A statue of Arago stands in Perpignan and seeing it the other day reminded me of just how grey the recent batch of Presidential hopefuls were by comparison. 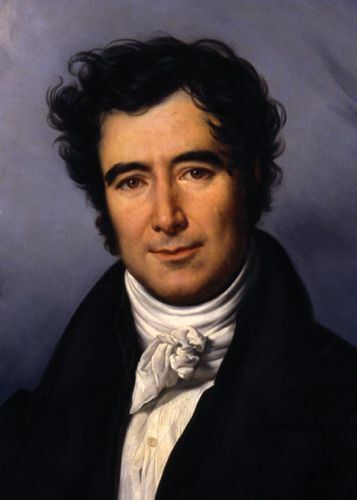 If he’d been on the hustings today, the colourful, charismatic adventurer François Arago would surely have hoovered-up enough votes at the first ask with nary a need for a tedious deuxieme tour. Some years after his death (and in recognition of his contributions to cosmic science) our local hero was honoured by having a sector of planet Mars named after him. And Arago’s legacy lives on in the PO today with numerous astronomical clubs throughout the region continuing his pioneering work. There’s recently been quite a resurgence of interest in star-gazing in this part of France so if you think you might like to have a go, check out this site for a club near you. And beginners needn’t worry – there’s plenty of friendly advice on hand for those of you who don’t know your Milky Way from the Rings around Uranus.